If you’re thinking of heading on a family adventure in Wales this summer school holidays but don’t quite know where to start, here are some suggestions on where to stay and what to do with your family whilst you’re there. 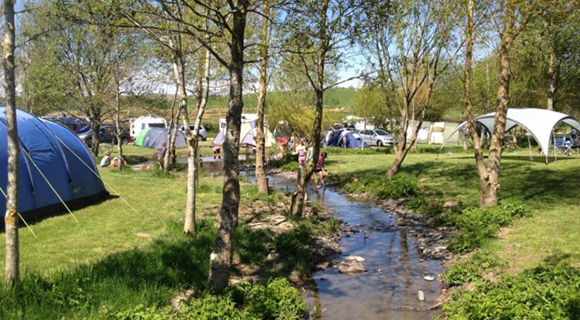 Wherever you choose to use as your base for your summer holiday in Wales it will not disappoint any family member but we’ve shortlisted some of the best family friendly campsites in Wales, all close by to sites of beauty, adventure and relaxation. This park has been adorned with numerous awards including being graded 4 Stars by the Wales Tourist Board so we definitely wanted to include this one on our list. The park is great for all that want to visit the Isle and has everything you need to enjoy a stay here at any time of the year. All pitches include electricity, they’ve got a small shop where you can stock up on necessities, a playground for the kids to let off some steam and lots of open space to roam. They’re also Calor Gas stockists so you’re covered if you run out on your stay. Prices during the summer peak period are from £25 per pitch per night for a family of four on a standard electric pitch (£175 for 7 nights) - a great price for summer. It’s an ideal place to set up camp for a cycling or walking holiday with the family as you have the 130 mile Anglesey Coastal Path to take advantage of here with plenty to see and do along the way. 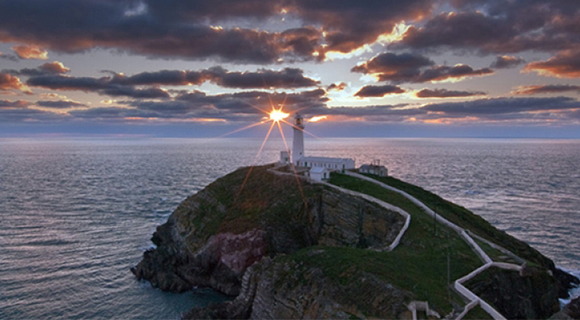 Points of interest include the sea arches at Bwa Gwyn, Ynys Y Fydlyn and Porth Wen; South Stack Lighthouse and Holyhead Mountain. Taking a detour from the path, you can try your hand at a bit of surfing, sailing or kayaking from one of the many beaches you’ll find on Anglesey. With six beaches having received Blue Flag status you’re sure to find one that will stay in your family memories for years to come. We’d suggest a stop at Llanddwyn Beach simply for the incredible views of Snowdonia in the distance, it really is a sight to absorb. Hafan Y Mor Holiday Park prides itself on creating an entertaining family atmosphere whatever the weather. 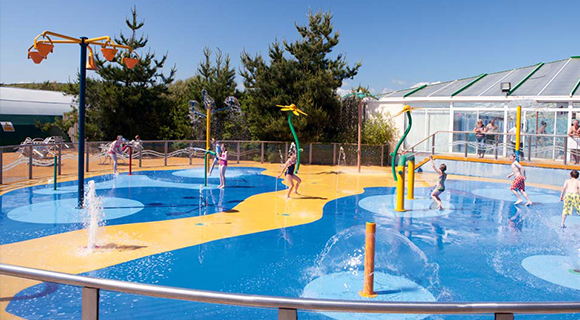 There’s tons to do on this Haven park from archery, fencing and their Nature Rocks activities to sliding, splashing and swimming in their impressive pool complex or hitting the heights on their Aerial Adventure course which is definitely not for the faint-hearted! All the facilities and entertainment come as part of the price you pay for your pitch so you should expect to pay more than at other, smaller parks in the area. A week’s stay here in the summer holidays will cost you from around £472 and upwards for a family of four, but this may differ depending on the type of RV you have. Don’t forget you have access to all the facilities and entertainment as part of the price so for under £17 per person per night, it’s not bad is it?! If you’re a family of beach lovers then you can be sure to find what you need for a sunny family day out at Black Rock Sands beach with its vast sandy beach and rolling dunes. Plus, there’s vehicle access on the beach here - no need to faff around trying to find a parking space nearby! For those that may want to see the area in a different mode of transport than the family car (or if you simply love trains) you could take a trip on the Ffestiniog and Welsh Highland Railway to take in the sights along its thirteen and a half mile track through forests, past waterfalls and lakes, up through the land climbing to upto seven hundred feet above sea level. Highly recommended if you have time - you can catch the train from Porthmadog Harbour. For a bit more of a historical masterclass, a visit to Criccieth Castle will satisfy any members of your party that love to learn about people that occupied the land in days gone by. It sits atop a craggy hill overlooking Tremadog Bay and can prove a great day out, especially if the weather is on your side. And of course you’re a stone’s throw from Snowdonia National Park where you can feast on the country air on a walk up a mountain if your choice, check out the numerous waterfalls that dot the area or simply have a picnic with the family. Whatever you decide to do on your stay in Wales, you’ll want to come back again and do the rest. If it’s peace and quiet and getting close to nature you want on your Wales holiday then Barcdy is the park for you and your family. It’s secluded enough that your holiday won’t be spoilt by the bustle of the larger towns not so far away and close by to many of the attractions that bring people to the area of Conwy. Its fully serviced, all weather touring pitches are ideal for most RVs and you’ve got all the necessary facilities on-site like a launderette, hot water, showers and toilets, gas and the all important hair dryer! And there are shops just a mile away if you need any other essentials on your trip. A week during summer on a multi-serviced pitch based on two adults and two children aged between 4 and 16 will cost from £203. There really is a whole lot to do around the area that all the family can take part in and enjoy. From hiking up mountains like Pen Y Fan and Snowdon which have child friendly routes (or a train if you get tired) to Surf lessons and courses at Surf Snowdonia Adventure Parc just a fifteen minute drive from the park. At Surf Snowdonia you can also take part in Splash & Crash where you jump off of a tall platform onto a huge inflatable below, tons of fun! 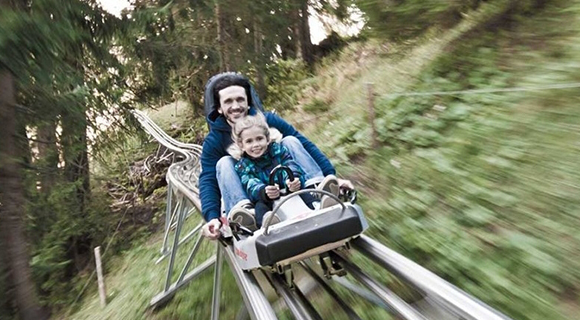 Also just fifteen minutes away is Zip World Fforest where you can sledge through the forest in your very own individual roller coaster at speeds of up to 25 mph, bounce through the forest on the Treetop Nets or make your way through the Zip Safari Ropes Course. There’s even a giant swing called the Skyride to scream on whilst feeling like flying! If all that adventure is too much for you, why not take a trip to the coast and visit Conwy Castle and Conwy Morfa Beach for a day of fun in the sun. Barcdy is a beautiful and quaint yet spacious park set in woodland near to the shores of the estuary of the River Dwyryd. It’s perfect for any length of break away to North Wales and an ideal base to explore the many points of interest that blanket the area. On the park, facilities include fully serviced all-weather pitches, a launderette, plenty of showers and toilets for everyone, gas and free WiFi. You can even rent a powerbank for your devices if need be. There isn’t a shop on site but there are some just a mile down the road where you can buy any essentials you may need. If you’re sticking around the park there are walks you can take up into the woods and to the lakes whilst taking in the views of the Snowdon Mountain Range and over the Llyn Peninsula. A 7 night summer holiday at Barcdy on a serviced hard-standing all-weather pitch will cost from £241.50 during peak times for a family of two adults and two children. Staying here means you’re lucky enough to be just across the estuary from the colourful coastal village of Portmeirion with its quirky italianate design and architecture and spectacular views. 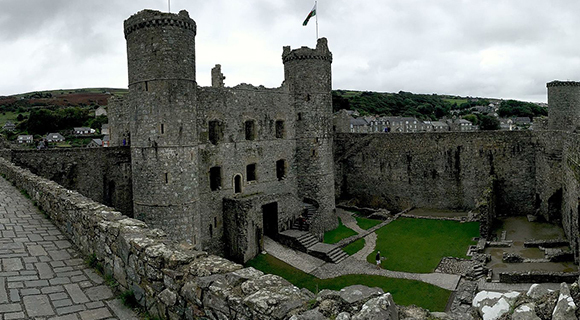 Historic Harlech Castle and beach are just a short ten minute drive away from the park for a quick escape to the seaside and of course you have Snowdonia National Park right on your doorstep with access to some incredible hiking and walking routes including the big one, Mount Snowdon. There’s a whole heap of stuff to do for everyone in the family in this part of Wales. Set in woodlands just inland from the mouth of the River Nevern that runs through the park, Llwyngwair Manor brings visitors back time again for its natural beauty, great staff and excellent value for money. 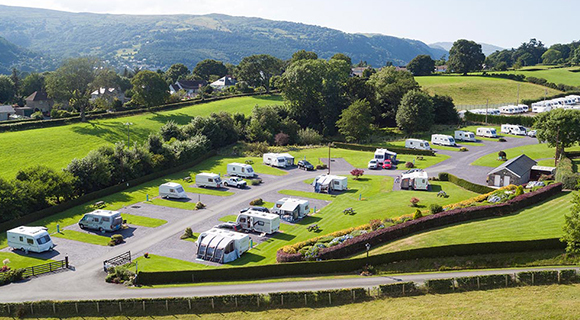 It's a little different from other campsites in Wales and the grounds of the manor provide a perfect backdrop for a relatively laid-back and stress-free family holiday in the summer. Campers have access to the well looked after shower and toilet block with plenty of hot water to keep you feeling fresh on your trip. When you need to feed the brood, The Manor Bar and Restaurant is the place to go for a tasty breakfast or lunch - you can pre-book a breakfast at the Manor for £7.50 per person. The Manor Bar has a TV, WiFi, Snooker tables and a games room attached with live music some weekends during peak periods. If you can make it during August, they are hoping to have a beer, cider and music festival so...enough said. It’s a perfect home away from home if you don’t fancy venturing off the park in the evenings. If you’re an active family there’s plenty of space to roam and cycle, tennis courts are available to hire for a small charge, they’ve got three kids play areas on the park and a lake and river running through it where you can fish (NRA licence needed). 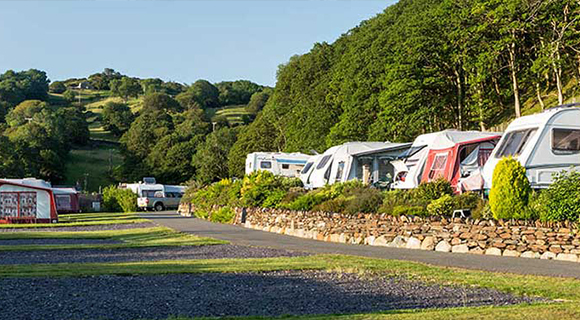 A 7 night break during the summer school holidays for a family of four (2 adults and 2 children aged 1-15) will cost from around £203 including an electric hookup for a caravan or motorhome pitch. You’re in for a treat with Llwyngwair, it’s not too far away from the bigger towns in Pembrokeshire but far enough away for it to feel like a real ‘get away from it all’ destination. What the park doesn’t provide you can find in the nearby town of Newport. Newport Bay, just a five minute drive from the park provides for a relaxing beach day when the weather is playing ball. The immediate area is steeped in history and you can visit and learn about Nevern Castle which is one of the oldest in Wales and played an important part in the Welsh nation becoming reality. 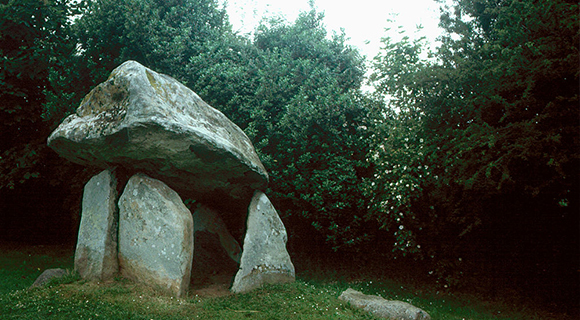 There’s also something for those that may enjoy something a little more morbid (we all have a morbid fascination about something or other) with Carreg Coetan Arthur, a Neolithic burial chamber on the outskirts of Newport. Holidaying here means you really do have the opportunity to take it easy and move at your own pace, we highly recommend it and so do so many others! Fforest Fields comes in the form of a five hundred acre farm set in the very heart of Wales. The owners are more than happy for their guests to take full advantage of the open space and invite them to explore the farm, woods and walking trails to their heart’s content. There are even a couple of lakes for you to enjoy a spot of paddle boarding , swimming or just messing about in. The touring pitches are spread over two camping fields with both hardstanding and grass pitches with plenty of electrical hook-ups. For a family of 2 adults and 2 children with an electric hookup pitch you will be spending £26 per night during the summer school holidays but they apply a 15% discount for 7 days or more (or if your over 65) so it would total around £178.50. They also allow you to bring up to 2 dogs along for free so no need to leave the pooches behind! As you’re right in the heart of Wales here, you may need to do a little bit of travelling to visit any points of interest that may be on your list, nothing too far away though. 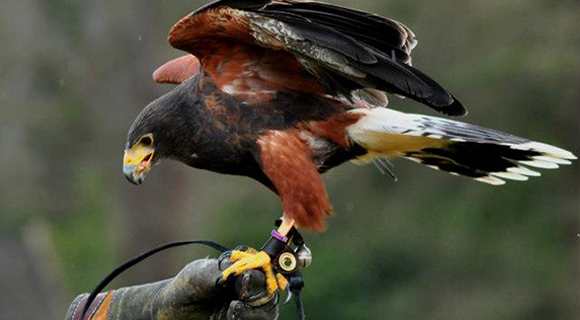 At Fforest Fields you’re around 45 mins to an hour away from plenty of attractions and days out for the family like Valley View Falconry where you can get up close and personal with a number of magical birds of prey. How about a trip to the Cantref Adventure Farm where you can pet and feed the animals and even watch the pig racing show! In fact, there’s tons you can do here with the family so we recommend you take a look at their website. And of course you have the Brecon Beacons to explore and enjoy spectacular views. This park, just west of the Wales/England border has to be our favourite of the selection, it just has so much to see and do whilst on park and is perfectly situated to take advantage of the many attractions in North Wales. 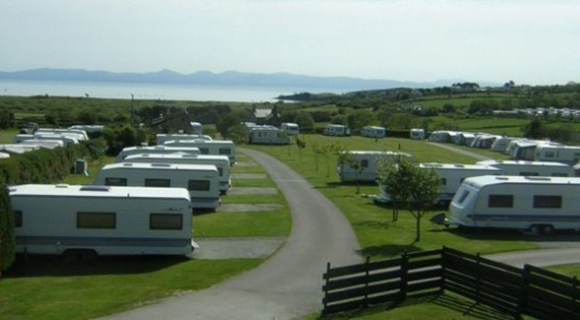 They’ve got two types of pitches available to book, Standard with 16 amp electric hookups and Deluxe which are all weather, fully serviced pitches that have got digital TV and Sky connections. The touring and camping amenities look great, with plenty of showers and toilets, individual washrooms and laundry facilities. And they have such a long list of facilities and amenities to keep you fed, watered and entertained on your stay, check these out: A nine-hole golf course; and clubhouse; pitch-and-putt and driving range; indoor heated swimming pool; WiFi; ‘Treetops’ licensed bar with entertainment; adventure play park; restaurant; Coffee shop; Hair & Beauty Studio & Men’s Barbers; Cycle Paths; Games Room; Caravan Accessories Shop; Retail village (crafts & boutiques); Badminton and table tennis; Sauna room; Personal Fitness Trainer; Two miles of nature trails over 247 acres of farmland; Fishing ponds and well-stocked mini-market and off licence. 7 nights at this fabulous park will only set you back £337 for a family of four arriving on the 23rd July on a Standard pitch. 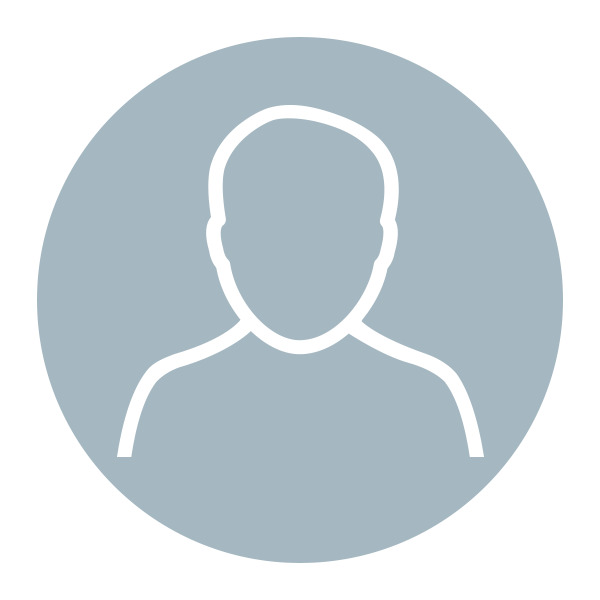 A great price for what you have access to on-site. 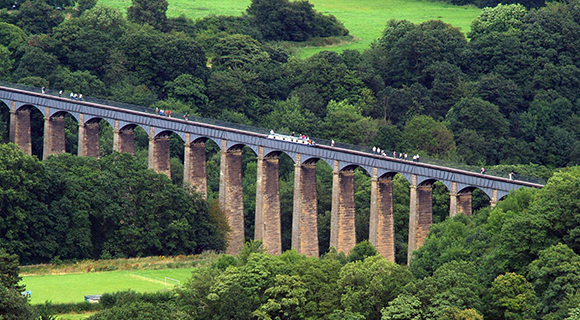 Just a twenty minute drive away from the park you can find the Pontcysyllte Aqueduct. Not only is it a pretty spectacular sight to behold from below or atop but you can even take a canal boat trip along it - I’m not sure I would be able to look down! Another point of interest just a twenty minute drive away is Chirk Castle. Steeped in Medieval history and over 700 years old, you can spend a day with the family exploring the dungeons and tower, play dress up or eat a picnic whilst taking in the views and wildlife from the gardens of the estate. There’s plenty of history to learn about in the area and interesting things to do for all the family, you won’t be disappointed here. A beautifully landscaped and well presented park in the southeast corner of the Llyn Peninsula, Eucoch is a labour of love for the family that run it. They’ve got you covered with all the facilities you’ll need for a great touring and camping holiday in the UK. They include a heated shower block, a launderette, an outdoor play area for the little ones and free WiFi throughout the park, which you don’t always find at some of the less commercial campsites. All of their pitches are serviced with an electrical hookup and a mixture of grass and hard-standing. It really is one of the most lovely, family friendly campsites in Wales that’s lucky to have amazing views over Cardigan Bay and Snowdonia. 7 nights starting from 21st July 2018 on a fully serviced, hard-standing pitch for a campervan or small motorhome will cost from just £231. This is for two adults and two children aged between 3 and 14 years old. 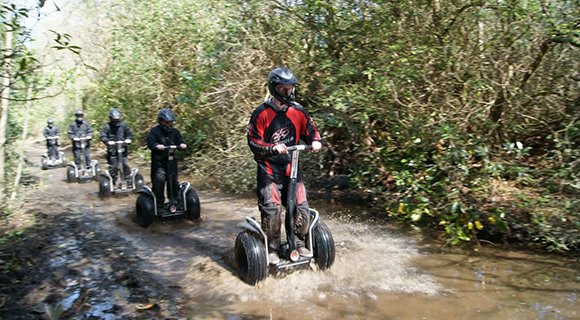 The park is surrounded by numerous points of interest for your holiday in this part of Wales. Whether its for the kids or for you, there’s something to spark everyone's interest. 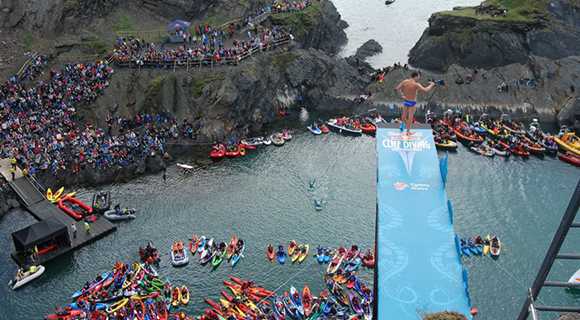 Why not try your hand at a bit of sailing or fishing or maybe climb a mountain!? All of these things are possible here. We recommend a day out to Abersoch where you can pretty much find all of these things! Tretio is a relatively small park in St Davids but still has more than enough to keep you busy on your summer break away to Wales this year. There’s only one hard-standing pitch available but plenty of grass pitches with electric hook up you can choose from to spend your time here. They’ve got a great big bouldering wall on-site where kids and adults can tame their climbing skills, a nine hole pitch and putt, orienteering courses for kids get involved with, a kid’s park and playing field to stretch your legs and let the little ones run wild. They’ve got all the facilities like hot water, a shower and toilet block, a shop so that you can get any essentials you forgot to bring along with you and they even provide freezer packs and battery charging for free. 7 nights in the summer school holidays will set you back just £217 for up to 4 people and one car with an electric hookup. And if you’re planning on bringing your four-legged friend along too you’ll pay just an extra £2 per night. St David’s Cathedral is a popular point of interest for those visiting the area. It’s simply huge and is bound to take your breath away when you enter its walls. You’re right by the West Wales Coastal Path where you can walk at your own pace just taking in the sights, sounds and wildlife whilst enjoying a picnic or pub lunch, there are so many places dotted along the way for you to choose from. Or you can head off to the famous Abereiddi Blue Lagoon which is just a ten minute drive away from the park, for a dip in the cool blue water or maybe even try a thrilling jump into it from one of the many platforms formed from the slate rock. If you’re feeling more like a lazy day at the beach then Whitesands Bay Blue Flag Beach is for you. With its wide expanse of soft sand, choice of watersport activities (if you have the energy) and the fact it’s considered one of the best surfing spots in Wales, why not get on your wetsuits and give it a go or lay back and relax, it’s up to you! 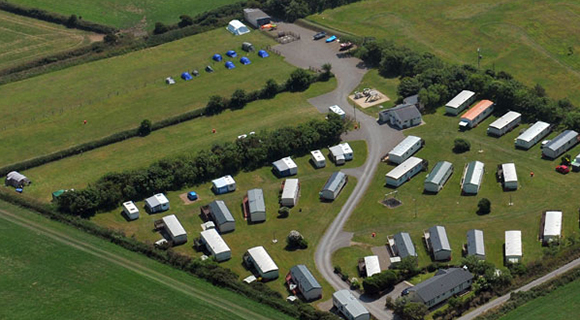 Greenacres is another Haven holiday park that we thought was well worth a mention. The park overlooks the vastness of golden sand at Black Rock Sands beach and the sparkling sea. The touring and camping facilities are as you’d expect; a heated shower and toilet block, a dishwashing area and a launderette. Whilst the other on-park facilities and entertainment are a big enticement for booking here. 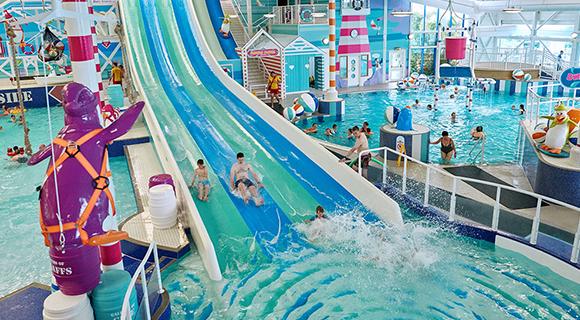 They've got a heated indoor pool, an outdoor Splashzone, adventure golf, cart hire and an all-weather multi sports court to keep you busy during the day and entertainment spanning day and night. There are shops, bars and restaurants and even direct access to the beach. In essence, you really never need to leave the park for your entire stay! A 7 night stay starting on 23rd July for 2 adults and 2 kids on a fully serviced euro hard-standing pitch will set you back £442. May seem expensive but it works out at under £16 per person, per night to stay here and have access to all the facilities as part of the price - nice! Greenacres actually sits on the outskirts of Porthmadog, a popular seaside town that attracts visitors from all over. 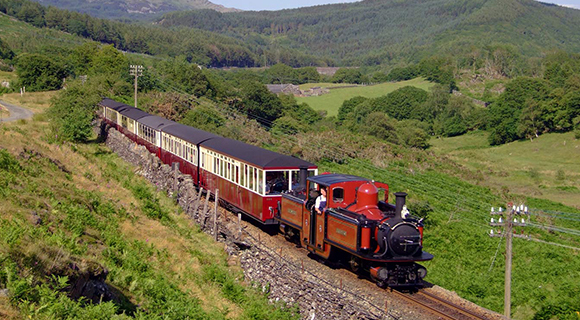 It has easy access to the Snowdonia National Park and the the Ffestiniog Railway. Just across the River Glaslyn (Afon Glaslyn) is Portmeirion village that is perfect to visit for the day with it’s interesting architecture and colorful surroundings. If you’re a keen golfer, Porthmadog Golf Club is just next door and if you’re a family full of adventurers and thrill seekers then Dragon Raiders Activity Park is for you. You can team up and go paintballing learn to survive in the wilderness like Bear Grylls or Segway around the family and off-road treks, whatever the weather! There’s a heap of things to do with the family around and about the park and we love this part of Wales, we hope you do too.